1) Transparency is now supported. When a feature is clicked, three sliders and a color selection box will appear in the main window's tool bar. These sliders can be used to change the color, draw width, draw radius, and alpha level (transparency) of the feature. The alpha value ranges from 0 (completely transparent) to 255 (completely opaque). Transparency can also be changed in the Edit Annotations window. Below, the GalK selection cassette and GalK ORF have had their transparency changed to show the overlap. The AmpR ORF was also made a bit more transparent. 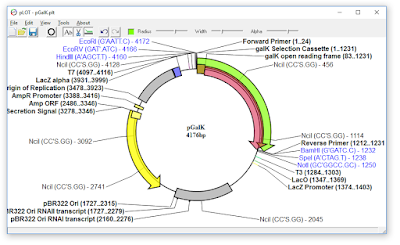 2) When the mouse hovers over labels for features or primers, the labels will highlight and the line indicating their position on the plasmid will now highlight as well. 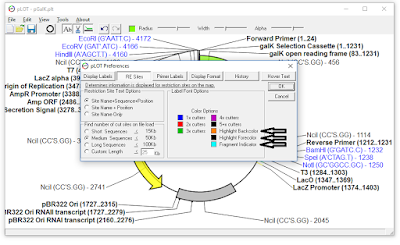 Enzyme labels and lines will highlight for all the cut sites for the enzyme being hovered over. Additionally, the description will appear in the lower status bar of the window. In the figure below, the mouse is hovering over an NsiI site, causing all of the others to show up as highlighted. 3) Hovering the mouse over a band on the virtual gel window will now highlight the corresponding region on the vector map. 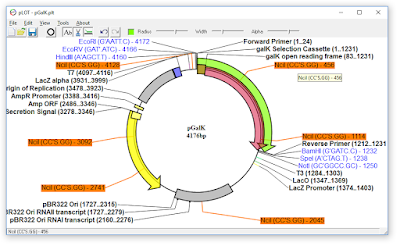 That way, if you have a missing band on a (real life) gel, you can quickly identify which part of your sequence was likely affected. In the figure below, the mouse is hovered over the band indicated by the arrow. The main window shows a colored pie shape indicating the corresponding region. 4) Several bugs I found have been patched. 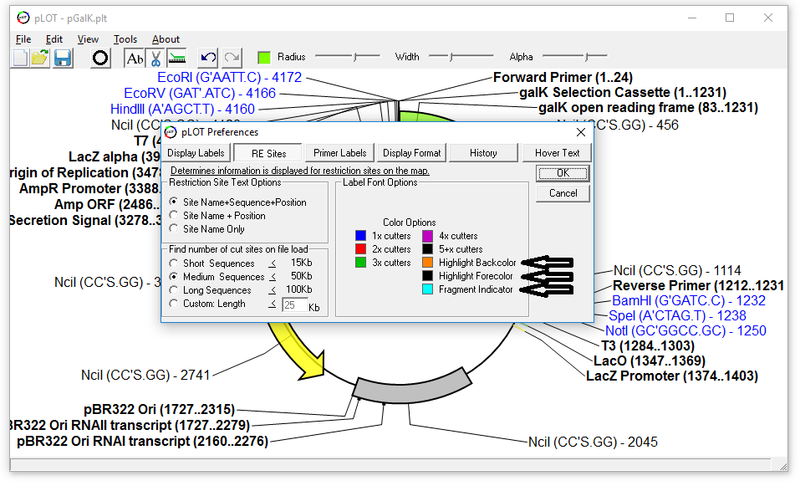 COLOR CUSTOMIZING: Colors for label highlighting and gel fragment indications can be customized under Edit>Preferences window>RE Sites tab. The forecolor (text color) and backcolor highlight text and background of labels respectively. 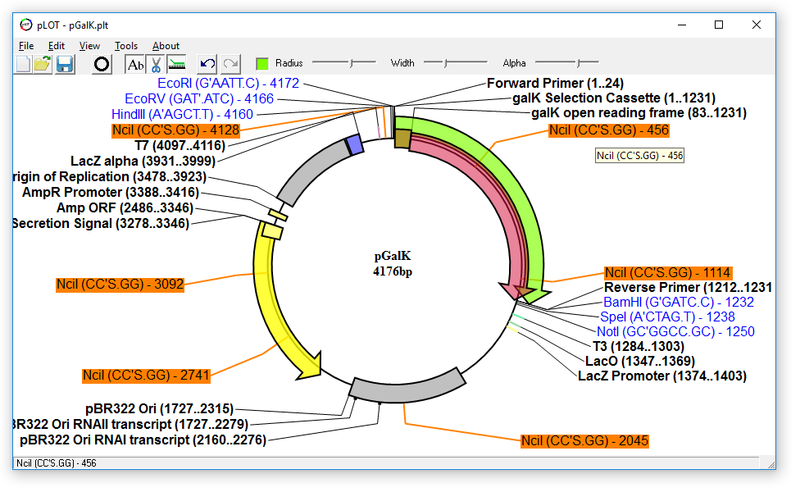 The gel fragment indicator color determines what color will be used to highlight the region of your sequence when the mouse is over a gel fragment.